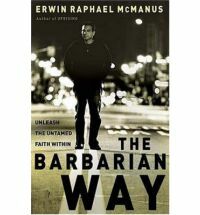 After reading the first few paragraphs, it was clear to me that Erwin Raphael McManus was attempting to illustrate how "civilized" most Christians have become and how far from the standard of behavior and passion that Jesus set for us in his life and ministry. Such a rich background of real life stories, both from the author's life and from history, illustrate the point, that is hard to imagine how anyone who reads this book will not have the leash holding their faith back from extraordinary actions ripped from their necks. I want to paint my face blue, wear animal skins and break all the rules for the Lord Jesus. I have, in fact, changed my behavior and my reaction to the world has been significantly altered. This is not only a Must read, it is a must do type of book. As I was reading this book, and I am a sloooooowww reader and I still only took less than 1 day to finish the first time, I first thought that this was a book that people who have accepted Jesus as Lord decades ago would have a very good chance of capturing the power and purpose they and always hoped to have, but missed. Yet, the more I read, it became obvious that New Christians would also benefit from this book, and might even get to miss the "lack of wonder" stage that so many Christians go through soon after accepting Jesus into their lives. It even occurred to me that leaders, students, employees, athletes and children could all learn how to face their fears and act with power. Pretty much, if you love Jesus, and you want to be in the kingdom as a warrior rather than a busboy, then read this book. The book starts by explaining why Jesus was so unaccepted by the world when he was in it, and relates that to the behavior of a Barbarian, while at the same time relating the religious community to the "Civilized." This is done artfully by juxtaposing scripture and other historical examples. He tells two stories from his own life, both early life as a Christian, and his family life, that had me crying. Not because of how 'sad' or 'funny' they were, but because without really trying, he had found the weakness of my own actions and behaviors, and that of the religious institutions of our own time, and opened my ears to the call of the Lord. And he did call. And I did hear. It scared me it was such a powerful moment. He goes on with the same high craft to tell us how we can change our own lives, so that we can life a life a true freedom and by so doing be the changed person we are called to be. This is not manuscript of philosophy, but rather a way to under stand the word of God through the Holy Spirit withing you. This is a how to book, though the only how to is how to be a barbarian for Jesus. The Holy Spirit and the Word of God do the rest of the telling, but once the fog of my entire life was lifted from my eyes, and I saw Jesus' life for what it was, everything was changed. There was one line of scripture in the first few pages that I felt he took out of context, and that interpretation permeated the entire book, but in the end, the miss us of one word, Fire, turned out to be totally unimportant. I could describe this book as an attack on Orthodox Churches, even my own, but that would be cynical. He really did not attack any Church. He attacked my understand of the power of God, and he was right. Plug into this book, but leave 3 hours, because once you buy it, you will not put it down happily.